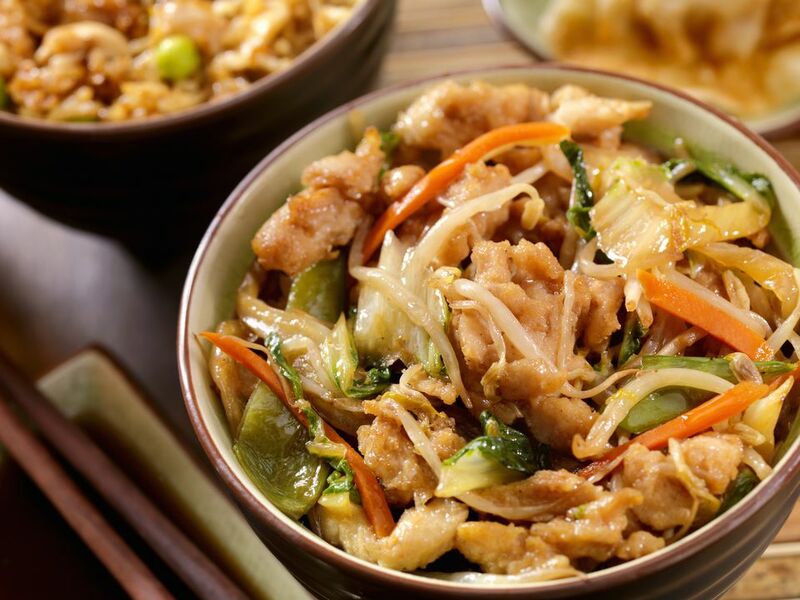 Chow mein and chop suey are both Chinese stir-fry dishes often found on restaurant and take-out menus. The two may seem similar, but their ingredients, preparation, and origins are different. Chow mein is one of the signature dishes of Chinese cuisine while chop suey is an American creation using Chinese cooking techniques. Chow mein is considered to be a more authentic Chinese dish than chop suey. While the origin of chop suey is not necessarily established, the historical background of chow mein is far less mysterious. Chow mein, (in Mandarin "ch'ao mien") meaning “stir-fried noodles,” originated in Northern China. While the chow mein served in take-outs and many American Chinese restaurants has been altered to appeal to Western tastes, it is based on an authentic Chinese dish of stir-fried vegetables with boiled noodles. When it comes to chop suey, one consistent belief is that it was invented in America by Chinese Americans. A story that has stood the test of time is that this dish was created by a legendary Chinese chef at a California mining camp. On a day he was short on ingredients and staff, he threw together a dish for his customers using whatever he had in the kitchen. He named it "tsa sui" in Mandarin, which means "miscellaneous broken pieces." The name became Americanized to "chop suey." There is no existence of a dish called "tsa sui" in China. Another tale is that chop suey was created at the Palace Hotel in San Francisco in the 1890s; Chinese leader Li Hung Chang was visiting and requested a dish of meat and vegetables that was "job suey," or "in fine pieces." The chef obliged and thus chop suey was born. These two Chinese restaurant dishes may share similar ingredients, but their concepts are a bit different. Chow mein is an established recipe where noodles are first boiled and then added at the end to a stir-fry of vegetables and sauce, keeping the noodles somewhat soft. In America, restaurants do have a tendency of frying the noodles until crispy. Chop suey, on the other hand, has a much looser recipe format. Meat and vegetables are chopped up and stir-fried with a sauce, but since it was invented to use whatever meat and vegetables were on hand to make a quick Chinese-inspired dish, the same philosophy translates into your kitchen. There are no noodles in chop suey; instead, the stir-fried mixture is served over rice. Besides being easy to make, both of these dishes are very adaptable. Like all Chinese food, what makes chop suey and chow mein memorable is not the specific ingredients so much as the balance between grains and vegetables. Both are ideal dishes to make when you want to clean out the refrigerator as the selection of vegetables is really up to you. When it comes to following a recipe for either chow mien or chop suey, don’t be afraid to make substitutions if you don’t have all the ingredients. The beauty of these types of dishes is their flexibility. While it’s preferable to have a wok, these dishes can easily be made in a frying pan.